James Croston informs us that Manchester was constituted an Assize Town in 1858. Local architect Alfred Waterhouse designed the building. "The architectural characteristics of the structure combine the Early English with Decorated Gothic...The plan includes a central block slightly advanced from the main structure, in which are placed the Grand Hall and the Sheriff's Court, with two wings, in the rear of which are placed the two principal Courts. In addition there are on the upper floor Grand Jury rooms, retiring rooms, Commissioner's Court, offices for the Prothonotary, Clerk of the Crown, and other officers. 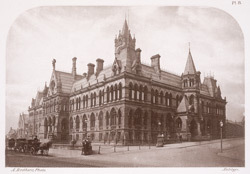 The principle facade is in Great Ducie-street, and, exclusive of the Judges' lodgings, is 256 feet long, with a depth along Southall-street of 166 feet. The entrance is by a handsome porch, with a row of pointed windows above, and surmounted by a lofty crocketed gable pierced with a large wheel window."